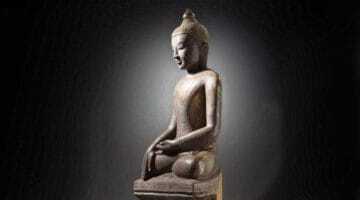 In mindfulness meditation, or shamatha, we are trying to achieve a mind that is stable and calm. What we begin to discover is that this calmness or harmony is a natural aspect of the mind. Through mindfulness meditation practice we are just developing and strengthening it, and eventually we are able to remain peacefully in our mind without struggling. Our mind naturally feels content. An important point is that when we are in a mindful state, there is still intelligence. It’s not as if we blank out. Sometimes people think that a person who is in deep meditation doesn’t know what’s going on—that it’s like being asleep. In fact, there are meditative states where you deny sense perceptions their function, but this is not the accomplishment of shamatha practice. There are certain conditions that are helpful for the practice of mindfulness. When we create the right environment it’s easier to practice. It is good if the place where you meditate, even if it’s only a small space in your apartment, has a feeling of upliftedness and sacredness. It is also said that you should meditate in a place that is not too noisy or disturbing, and you should not be in a situation where your mind is going to be easily provoked into anger or jealousy or other emotions. If you are disturbed or irritated, then your practice is going to be affected. I encourage people to meditate frequently but for short periods of time—ten, fifteen, or twenty minutes. If you force it too much the practice can take on too much of a personality, and training the mind should be very, very simple. So you could meditate for ten minutes in the morning and ten minutes in the evening, and during that time you are really working with the mind. Then you just stop, get up, and go. Often we just plop ourselves down to meditate and just let the mind take us wherever it may. We have to create a personal sense of discipline. When we sit down, we can remind ourselves: “I’m here to work on my mind. I’m here to train my mind.” It’s okay to say that to yourself when you sit down, literally. We need that kind of inspiration as we begin to practice. The Buddhist approach is that the mind and body are connected. The energy flows better when the body is erect, and when it’s bent, the flow is changed and that directly affects your thought process. So there is a yoga of how to work with this. We’re not sitting up straight because we’re trying to be good schoolchildren; our posture actually affects the mind. Often we just plop ourselves down to meditate and just let the mind take us wherever it may. We have to create a personal sense of discipline. People who need to use a chair for meditation should sit upright with their feet touching the ground. 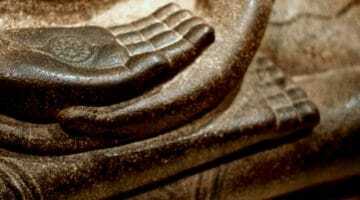 Those using a meditation cushion such as a zafu or gomden should find a comfortable position with legs crossed and hands resting palm-down on your thighs. The hips are neither rotated forward too much, which creates tension, nor tilted back so you start slouching. You should have a feeling of stability and strength. When we sit down the first thing we need to do is to really inhabit our body—really have a sense of our body. Often we sort of prop ourselves up and pretend we’re practicing, but we can’t even feel our body; we can’t even feel where it is. Instead, we need to be right here. So when you begin a meditation session, you can spend some initial time settling into your posture. You can feel that your spine is being pulled up from the top of your head so your posture is elongated, and then settle. The practice we’re doing is very precise: you should be very much awake even though you are calm. The basic principle is to keep an upright, erect posture. You are in a solid situation: your shoulders are level, your hips are level, your spine is stacked up. You can visualize putting your bones in the right order and letting your flesh hang off that structure. We use this posture in order to remain relaxed and awake. The practice we’re doing is very precise: you should be very much awake even though you are calm. If you find yourself getting dull or hazy or falling asleep, you should check your posture. For strict mindfulness practice, the gaze should be downward focusing a couple of inches in front of your nose. The eyes are open but not staring; your gaze is soft. We are trying to reduce sensory input as much as we can. People say, “Shouldn’t we have a sense of the environment?” but that’s not our concern in this practice. We’re just trying to work with the mind and the more we raise our gaze, the more distracted we’re going to be. It’s as if you had an overhead light shining over the whole room, and all of a sudden you focus it down right in front of you. You are purposefully ignoring what is going on around you. You are putting the horse of mind in a smaller corral. When we do shamatha practice, we become more and more familiar with our mind, and in particular we learn to recognize the movement of the mind, which we experience as thoughts. We do this by using an object of meditation to provide a contrast or counterpoint to what’s happening in our mind. As soon as we go off and start thinking about something, awareness of the object of meditation will bring us back. We could put a rock in front of us and use it to focus our mind, but using the breath as the object of meditation is particularly helpful because it relaxes us. No matter what kind of thought comes up, you should say to yourself, “That may be a really important issue in my life, but right now is not the time to think about it. Now I’m practicing meditation.” It gets down to how honest we are, how true we can be to ourselves, during each session. Everyone gets lost in thought sometimes. You might think, “I can’t believe I got so absorbed in something like that,” but try not to make it too personal. Just try to be as unbiased as possible. Mind will be wild and we have to recognize that. We can’t push ourselves. If we’re trying to be completely concept-free, with no discursiveness at all, it’s just not going to happen. So through the labeling process, we simply see our discursiveness. We notice that we have been lost in thought, we mentally label it “thinking”—gently and without judgment—and we come back to the breath. When we have a thought—no matter how wild or bizarre it may be—we just let it go and come back to the breath, come back to the situation here. Each meditation session is a journey of discovery to understand the basic truth of who we are. In the beginning the most important lesson of meditation is seeing the speed of the mind. But the meditation tradition says that mind doesn’t have to be this way: it just hasn’t been worked with. What we are talking about is very practical. 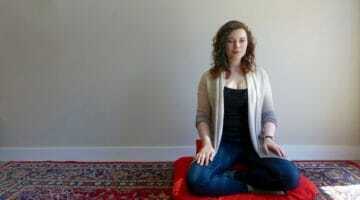 Mindfulness meditation practice is simple and completely feasible. And because we are working with the mind that experiences life directly, just by sitting and doing nothing, we are doing a tremendous amount.